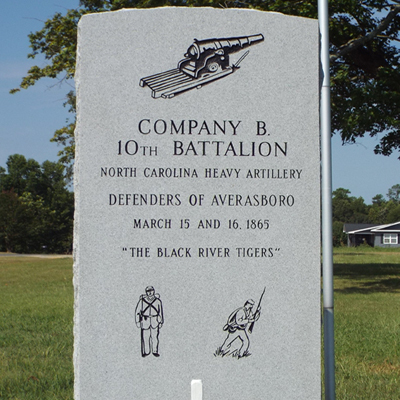 The marker to Company B, 10 Regiment of the NC Heavy Artillery, known as the “Black River Tigers,” stands just over six feet tall consisting of a granite block 30 inches wide and 9 inches thick on a granite base with a concrete pad for the foundation. 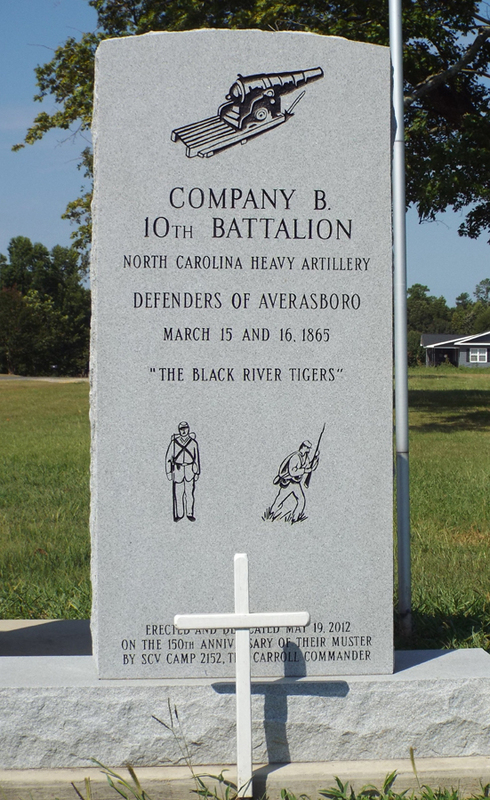 The monuments front face, in addition to the inscription, has incised a piece of heavy artillery at the top and two soldiers at the bottom. One soldier is at parade rest and the other appears to be charging. The list of names on back of the marker is the original Black River Tigers roster. A marker to the history of Old Averasborough and a memorial to the Six Sons of Thomas and Mary Avera form a triangle on the concrete pad. Four flagpoles surround this grouping. One flies the American flag, one the Confederate national flag, one the Confederate battle flag and one a Revolutionary War era flag. The dedication ceremony took place at 3 PM with Confederate soldier reenactors present. The site is a permanent private easement to Bryan Avery but within a few feet of the public right of way. The public may access the site. The easement for the site was provided by Wade Hampton West. The monument stands on the northwest corner of a four way intersection, Salt Market Street and Norris Road run east-west, and Chicora Road runs north-south. The monument forms a triangle, along with Olde Averasborough Monument and a marker to the Six Sons of Thomas and Mary Avera. The monument stands on the grass in rural area outside the town of Erwin.